Designed by Bruce Goff for Joe Price initially for a site in Bartlesville, Oklahoma; Mr. Goff and I were working together as associated architects to create this museum for Price's Japanese art collection. 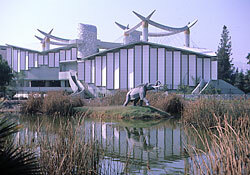 At around the time of Mr. Goff's death in 1982, Joe Price had decided to build the building in Los Angeles as a pavilion addition to the Los Angeles County Museum of Art. The design was in the schematic phase at that point and was completed by me to incorporate the requirements of the Los Angeles County Museum of Art and the new site. The roof structures of the galleries are suspended by cables to allow for non loadbearing translucent perimeter walls for ideal lighting conditions for the art. When asked Joe Price said that "the art is the client" so all design decisions were made based on what was best for the art.